The Chiefs' beleaguered bunch forced Jacksonville quarterback Blake Bortles into five turnovers, including a pick-six by defensive tackle Chris Jones (left). KANSAS CITY, Mo. — Patrick Mahomes had finally thrown an interception, the first all season for the Chiefs’ talented young quarterback, and the Jacksonville offense had shuffled back onto the field. Oh, the league’s highest-scoring offense still made plays. Kareem Hunt ran for 87 yards and a touchdown, and Travis Kelce hauled in five catches for 100 yards, helping the Chiefs (5-0) move the ball at will against the NFL’s top-rated defense. 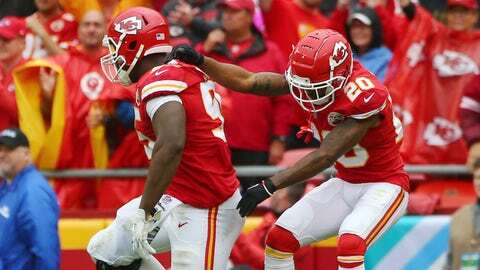 Tyreek Hill, who was frequently matched up with the Jaguars’ Jalen Ramsey in an entertaining one-on-one affair, added four catches for 61 yards as the Chiefs rolled up 424 yards total. “You can’t let emotions get the best of you,” Chiefs coach Andy Reid said. If anybody had reason to get frustrated it was Bortles, who was 33 of 61 for 430 yards with a touchdown and those four interceptions. Most of his yardage came in garbage time, and while he ran for a touchdown, he also was strip-sacked during Jacksonville’s miserable first half. Mahomes led the Chiefs 73 yards on their first possession, finishing the drive himself with a short scramble for a touchdown. Then he led the league’s high-powered offense 82 yards for a field goal a few minutes later, leaving Jacksonville’s vaunted D second-guessing itself. Meanwhile, the Jacksonville offense was having all kinds of problems. Jacksonville (3-2) drove inside the Kansas City 5 early in the second quarter, but an incomplete fade on third down and another incompletion on fourth turned the ball over. Bortles was stripped on the first play of the Jaguars’ next possession, and he threw the pick-six to Jones on the first play of the next. The calamitous half ended when Bortles, trying to force a pass into the end zone, instead bounced it off his offensive lineman’s helmet and right to Steven Nelson for another interception. In Bortles’ defense, his offensive line didn’t give him much time. Along with the five sacks, the Chiefs were credited with 11 hurries, spending most of the game in his face. Bortles’ only real highlight came late in the game, when he escaped the collapsing pocket and angled toward the sideline, then lowered his shoulder to finish off a 21-yard touchdown run . The Chiefs’ first TD was the first allowed by Jacksonville on a team’s opening possession. … The Jaguars have not started 2-0 on the road since the 2007 season. … Jaguars RB T.J. Yeldon had 53 yards rushing. … Chiefs WR Sammy Watkins had six catches for 78 yards.